Imagine the sickening, painful fullness you feel after eating at a buffet, and the struggle to breathe or move. Now multiply that feeling by 100, and that's pretty much what it's like to be a duck or geese brutally force-fed to make foie gras. Foie gras is a French delicacy made of fattened duck or goose liver. 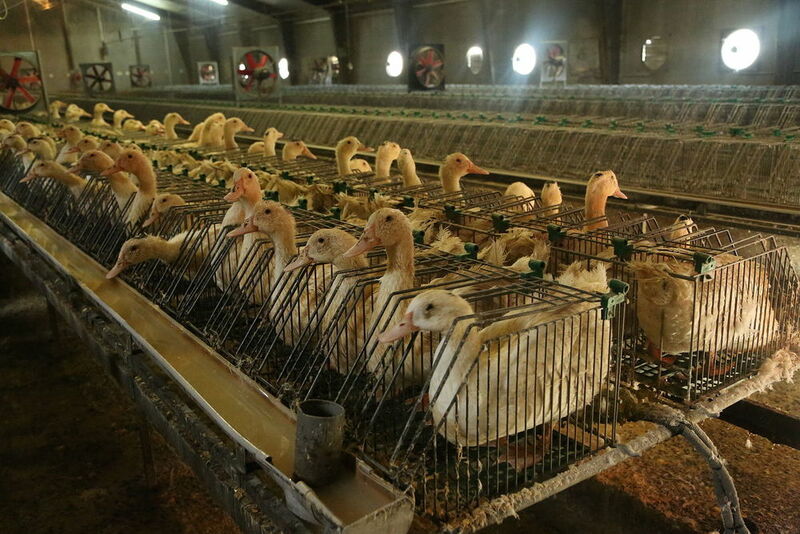 And in typical industrialized food production settings, these poor ducks and geese are crammed into tiny cages (with no room to move) while pipes are shoved down their throats multiple times a day. These pipes filled with grain and fat administer up to four or more pounds per day in order for the livers to swell up, leaving the birds panting and in pain. Aside from being in cramped cages, the liver swelling immobilizes the ducks and geese--social animals who normally like to forage and swim. As anyone would feel under such stress and abuse, these fowls are driven to madness and aggression, causing them to attack each other or rip out their own feathers. The abuse, of course, doesn't end there. Similar to the egg industry where only egg-laying hens are of worth, in the foie gras industry, only the livers of male ducks are used. As a result, approximately 40 million unwanted female ducks are ground up alive and used as fertilizer or in cat food. Again, this is all too horrifyingly similar to commercial egg production. Unfortunately, this vile and vicious practice isn't just happening in France. It also takes place here in the U.S., such as in New York's Hudson Valley Foie Gras, where workers are required to feed up to 500 birds per day. As with high-speed slaughterhouses, this unrealistic pace causes workers to roughly handle the birds. According to PETA, a worker from Hudson Valley Foie Gras reported that "tumor-like lumps" were found in some birds due to force-feeding. "One duck had a maggot-covered neck wound that was so severe that water spilled out of it when he drank. Workers routinely carried ducks by their necks, causing them to choke and defecate in distress." NO animal should endure this senseless suffering and abuse ... ESPECIALLY for a mere delicacy. We need to put a stop to this heinous practice. 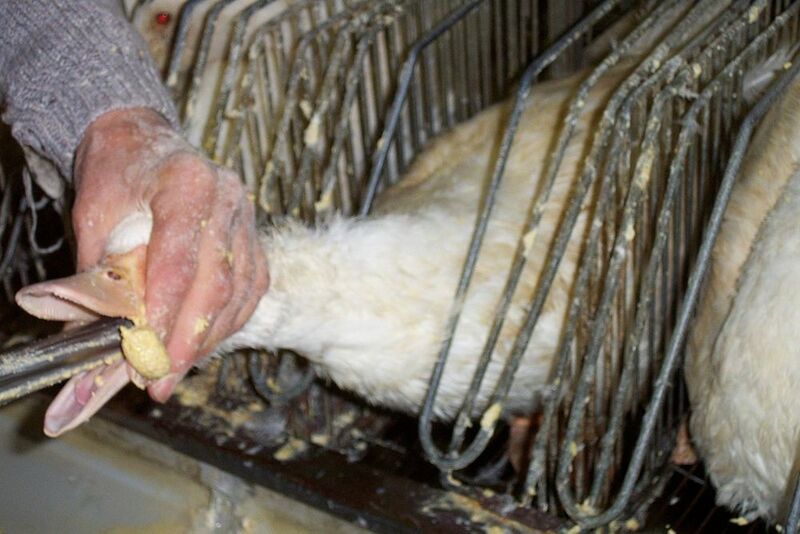 Sign this petition to help ducks and geese by banning foie gras in the United States. Urge restaurants and stores in your area (and other counties and states) that sell foie gras to stop doing so and sell vegetarian pâté instead (e.g. Bonavita, The Organic Gourmet, Toby's Family Foods and Bean Thinking, Ltd). Tell local businesses that you and your friends and family won't support them until they stop supporting the foie gras industry.